As one of the Capital's architects you must raise a brand new city from the ashes of the old. Choices must be made: iconic monuments bring great prestige, but at what cost? Aggressive expansion may increase poverty, but how much do you care? Your rivals are busy too, so plan wisely to ensure your buildings dominate the skyline. Martin Wallace's classic tableau-builder has been entirely updated for this edition, with revised rules and new artwork. Oversized borough cards showcase famous locations, while the city cards follow the development of London right up to the twentieth century. Grow your city through the years, as you vie to become an icon of London. Without doubt one of my favourite Martin Wallace games. Though containing a very attractive map of London which plays a significant part in the game, the real heart of the production and the game system are the detailed, colourful cards that are gradually laid out on the card display at the bottom of the map. In essence, this a card management game, but one with many unusual elements. As you acquire these cards during the course of the game, you will lay some of them out in order to build your own separate version of the city of London and keep others for the crucial moments when you run your city. This is the vital action, for each card in your city may bring in anything from vital wealth to victory points, but in typical Martin Wallace fashion there are some dire penalties. These are the cards which garner poverty points on top of the initial five poverty points every player starts with. Fortunately, there are ways to get rid of them, but failure to do so by the end of the game brings horribly escalating negative victory points. 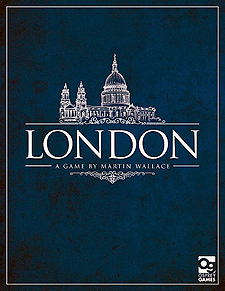 Thw whole package from box art to full-colour rulebook, atmospheric mapboard of London to the stunning scenes of London on the carsd support the theme of the game.